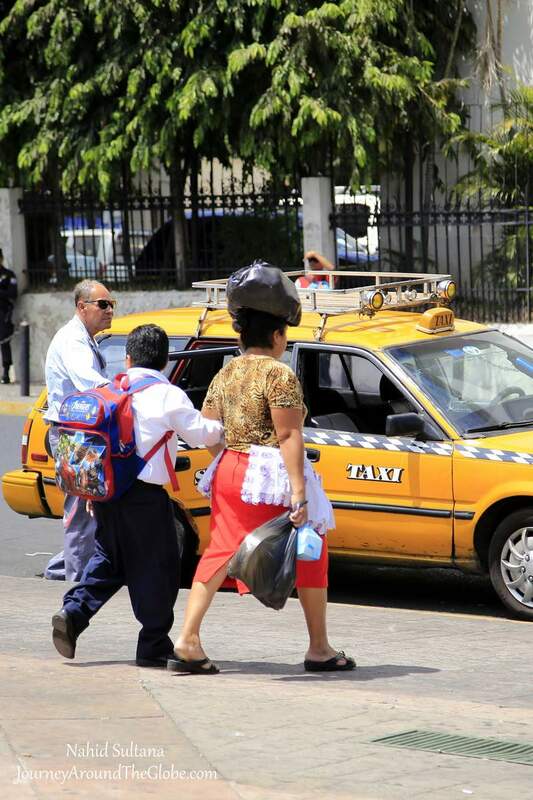 SAN SALVADOR, EL SALVADOR: El Salvador was my first country to visit in Central America. I have to say all of my stereotype opinions about Central America were erased on the very first day in this stunningly gorgeous country. Although there is nothing much to do or see in the capital San Salvador, it can be a good base to start off the journey in El Salvador. Like any other capitols, this is a big cosmopolitan area with big buildings, crowds, and traffic jam. Downtown is a good place to feel city’s energy and learn about its past, although most of its historic buildings were destroyed or damaged by different earthquakes. The capital, San Salvador, is surrounded by big and small mountains. It’s beautiful especially when you can see the San Salvador Volcano from distance which you can actually hike for a fantastic view of the city. Don’t worry, it’s been dead for many years…but as the Salvadorans say, no volcanos are dead, they are just sleeping…you never know when they will wake up again. There is a $10 entry visa that you can get in the airport to enter El Salvador with American passport. US Dollar is their official currency; so foreigners can buy and get change back in USD for any purchases or meals. TIME of TRAVEL: We went to Central America around my girls’ spring break, Mid-March of 2015. Our first stop was in El Salvador, then to Panama, Costa Rica, and finally to Nicaragua. Within El Salvador, we spent a day in San Salvador, one day in historic town of Suchitoto, and last day in Joya de Ceren, visiting the Mayan ruins. The climate is very tropical here and temperature in El Salvador is usually constant throughout the whole year. We were there during the dry season. You don’t want to come here in the monsoon when you can’t get around as much. EATING and SHOPPING: Spanish conquerors ruled this part of the continent for few centuries and left many influences here. But don’t expect to get tapas at every corner, like me. The food is more similar to Mexican, but we didn’t see any tacos or burritos. Our dinners in the capital were mostly from the fast food restaurants that we had close to our hotel. When we were touring San Salvador in a cab, we had lunch in Marcado de Artisans. There was only one restaurant inside the market complex with cheap but good food. Central Americans eat rice for breakfast, lunch, and dinner. You will get rice almost with any dish. We had flavored rice with bean and chicken, an interesting chicken soup with rice and chicken gizzards, and bite size tortilla on the side. The food was simple but very tasty. Other than that, San Salvador has all the American fast food places, like Wendy’s, McDonald’s, KFC, Subway, Pizza Hut, Popeye’s, and etc. If you want to try a local chain which also serves local dishes, Mr. Donut is a good and clean place. 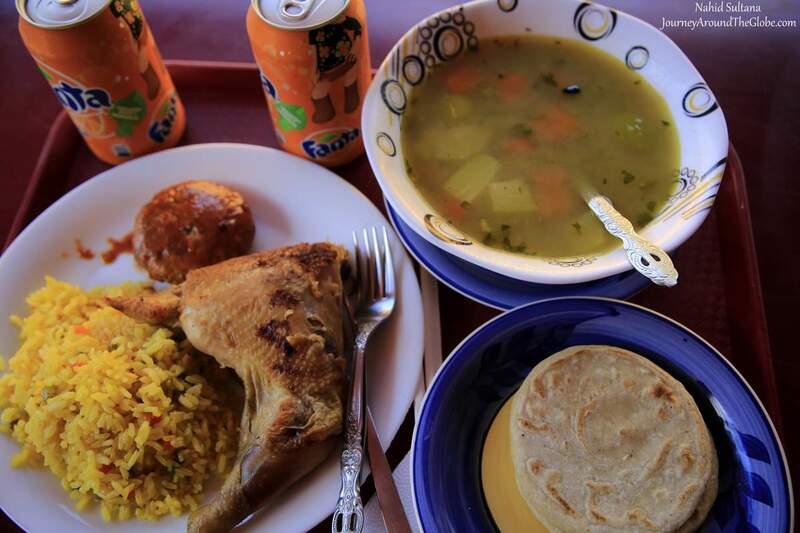 By the way, they don’t only offer donuts, you can get full lunch or dinner with sides…all Salvadoran style. 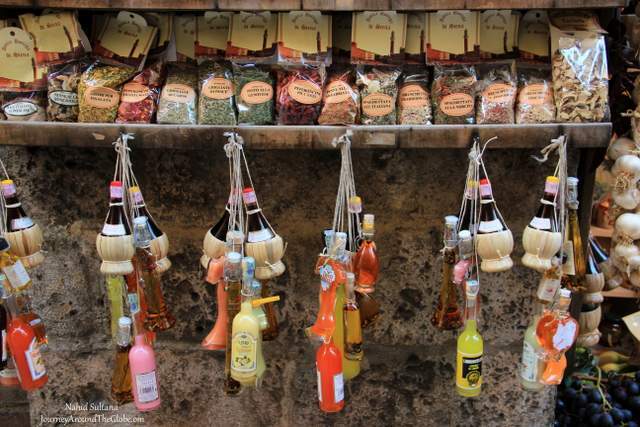 Marcado de Artisans is probably the best place for souvenir hunters. We didn’t see so many gift shops in one place like Marcado de Artisans anywhere else in San Salvador. Salvadoran gifts are usually brightly colored, mostly depicting rainforest lives. You can find dolls in traditional outfits, different animals and birds, religious items, paintings, and many household items for everyday usage. Hammock is very popular here and all over Central America…you will have plenty of options in this market. 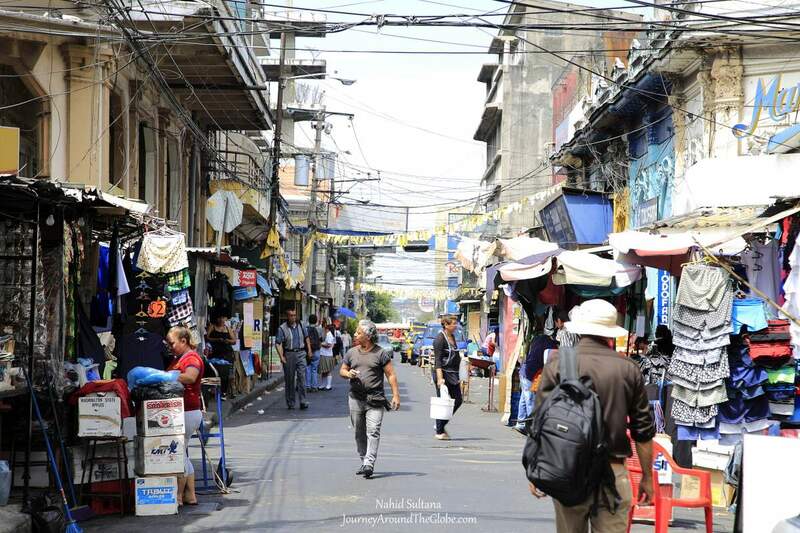 PLACES WE’VE VISITED: We had 3 nights in El Salvador, out of which we spent 1 day in San Salvador, the capital. It’s almost impossible to see the sites on foot, since everything is scattered around the whole town. We rented a cab from the hotel concierge for a day and told the driver, who didn’t speak much English, what we want to see and do. It was $10 per hour for 7 or 8 hours. 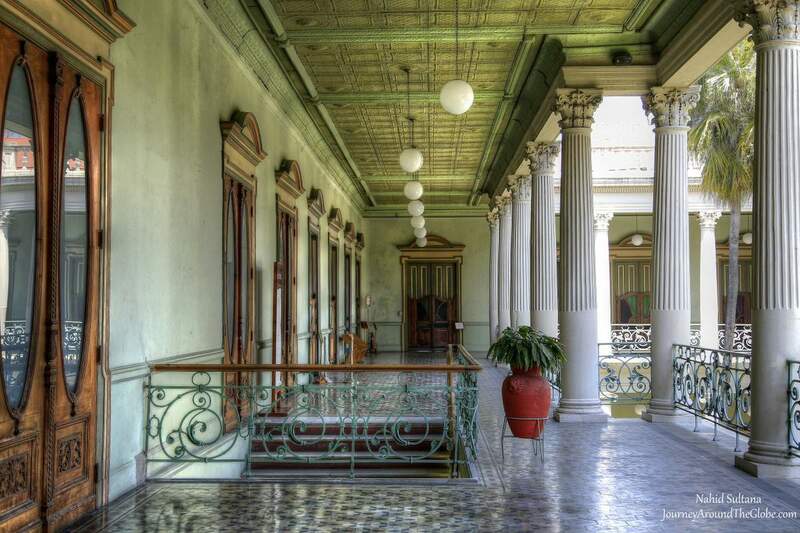 We didn’t visit any museums in San Salvador, though the city has lots of them. David J Guzman National Museum of Anthropology is known to be one of the most important ones. We passed by Teatro Nacional in downtown which can be a good place for music and theater lovers. 1) FUENTA LUMINOSA: First thing in the morning, the cab took us to Fuenta Luminosa, or Monument to the Sea. It is a big round-about with a grand water fountain in the middle of a busy intersection. I couldn’t take any picture during the day only because it was hard to stop in the middle of the street, but the fountain supposed to be extraordinary at night with its fantastic lights and colors. 2) IGLESIA CANDELARIA: This church sort of showed up in front of us while we were driving towards Catedral Metropolitana. If it wasn’t for our cabby, we probably wouldn’t have stopped here. He parked by the church, rang a bell, and talked to the lady behind a gated door to make an arrangement for us to go inside. After passing a small courtyard and some cats and dogs, the lady opened a gate to the church. It’s a 100 years old church and still active. Inside is small and simple but nicely embellished. The altar is nicely curved out of wood and adorned with not-so-overwhelming decorations. 3) CATEDRAL METROPOLITANA: This is probably city’s most important and iconic place of worship. 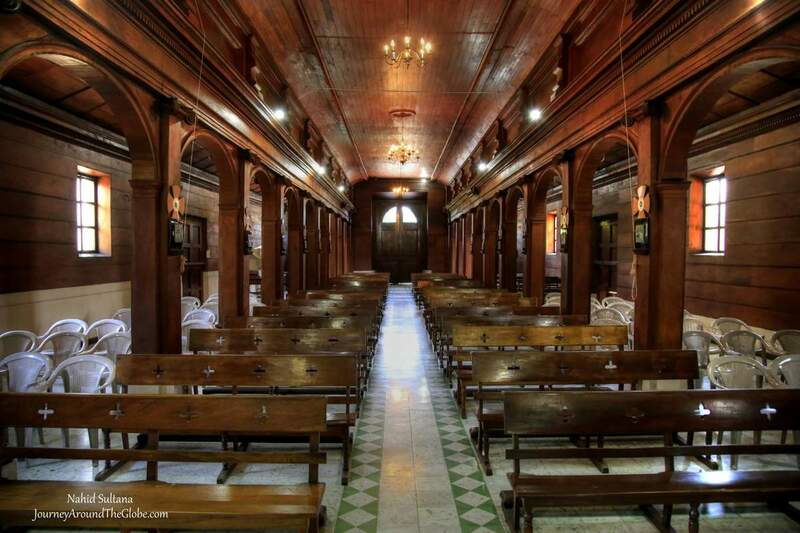 It is big in size, beautified with exquisite wood curved altar, and has beautiful patterns on the ceiling. The cathedral is located in Plaza Barrios in the city center. Opposite of the cathedral is Teatro Nacional or National Theater. There is a small parking space in front of the church. For $0.50, you can park there for a short-term while visiting the church and surrounding. 4) NATIONAL PALACE: National Palace is right beside the cathedral, within walking distance. After crossing a really crowded and busy street, we climbed the stairs to go inside the palace. Historically, the first National Palace was constructed in 1870, but it was completely destroyed in 1889. The present building is from 1905 – 1911 by Captain and President Gerardo Barrios. I almost felt like I was in Andalusia while roaming around the rooms and balconies of National Palace. The small museum here can be a good place to learn about the past politics and history of El Salvador. Square in front of the palace is known as Plaza Barrios. 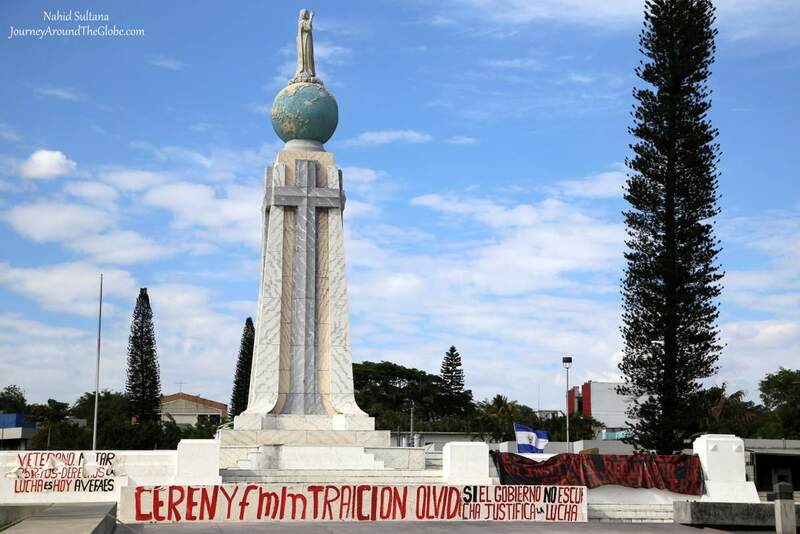 A statue of President Gerardo Barrios stands in the middle of the square. It was $3 per adult and kids were free. Plan to stay here at least an hour to look around the old rooms, balconies, lush Moorish style gardens, and small exhibitions and displays. 5) PLAZA LIBERTAD: We walked from National Palace to Plaza Libertad. It was a nice stroll because we came across some outdoor markets, saw locals doing their daily chores, and a hustling-bustling side of the city. Plaza Libertad is a nice spot with some trees and benches in the middle of all the city chaos. Many old buildings surround the plaza and a tall statue stands in the middle as a symbol of liberty. 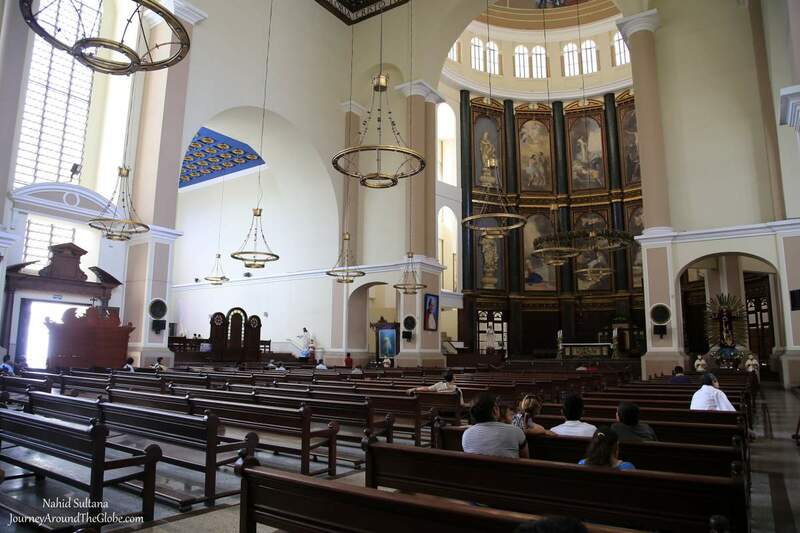 6) IGLESIA ELROSARIO: Opposite of Plaza Libertad is Iglesia Elrosario, a modern church in the heart of San Salvador. Built in 1970s, this is an architectural jewel of El Salvador. You may not imagine the stunning beauty this church holds from its outside look. 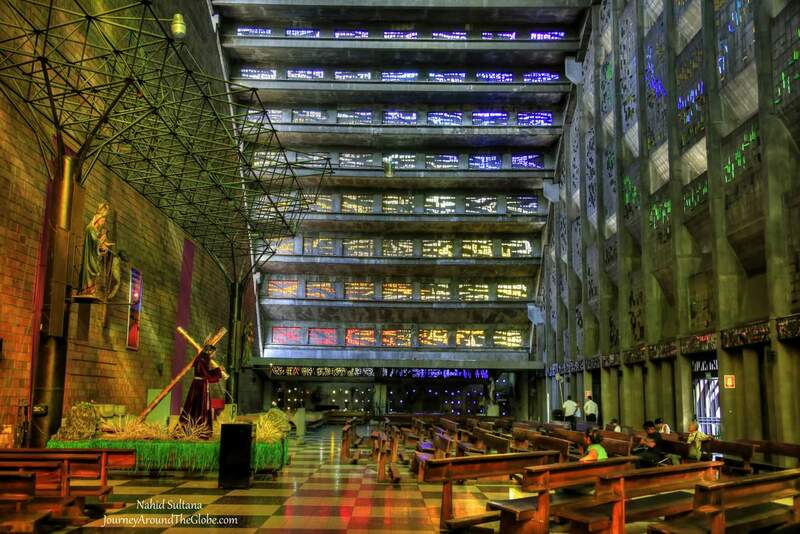 With contemporary architectural design, colorful stained-glass windows, non-cluttered altar, and gorgeous statue of Jesus carrying the cross make this place a must-see in San Salvador. The church is usually closed during the lunch time. We first tried to go there in the early afternoon but had to come back at the end of the day when it was open again. 7) BOULEVARD de los PROCERES: This is one of the widest boulevards in whole Central America. Ten busts of famous Salvadorans line on the both sides of the streets. It is a busy street and we couldn’t stop nor take any pictures. 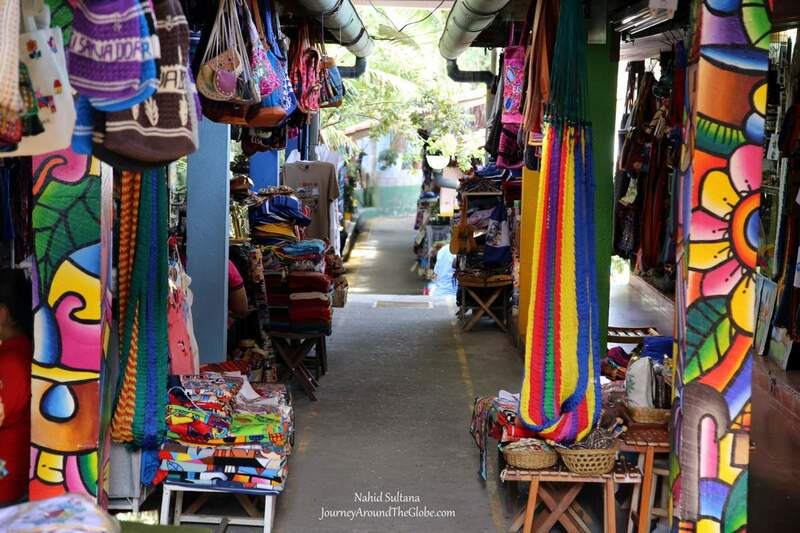 8) MERCADO de ARTESANIAS: This is a good place to buy cheap and local crafts, including hammocks and many other colorful items. We bought a small painting of a village scene here for a good price. You do have to bargain to get a good deal. Most of the stores have similar items. But do look around a bit to get the souvenir that you will cherish from El Salvador lifelong. 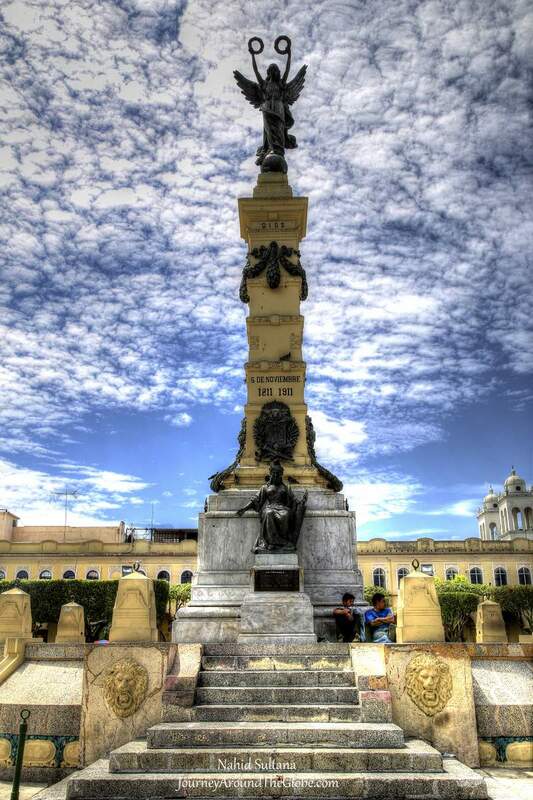 9) MONUMENTO al DIVINO SALVADOR del MUNDO: “Monument to the Savior of the World” is one of the most recognizable monuments in San Salvador. The Savior is the Patron Saint of San Salvador. This another busy round-about of the city. We had to make few rounds around it to get a clear picture. NANCY, FRANCE: Nancy is an elegant medium-sized French town in the region of Lorraine. The city is famous for some of its architectural masterpieces. 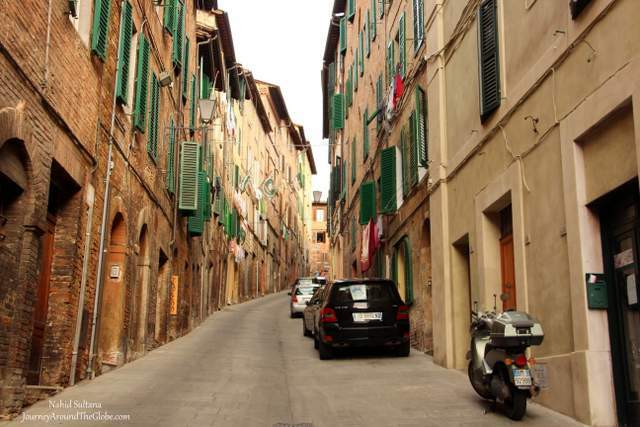 You can see touch of both medieval and Renaissance in its old part. 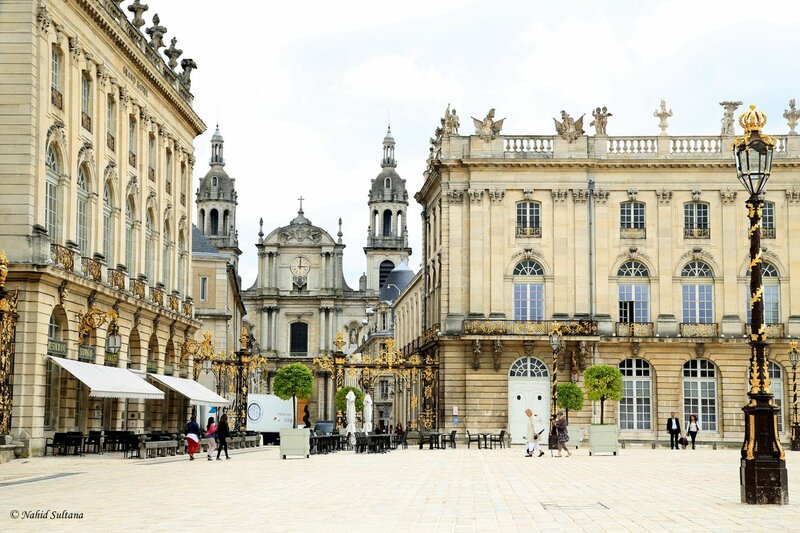 Nancy is also considered as an Art Nouveou jewel in this region of France. 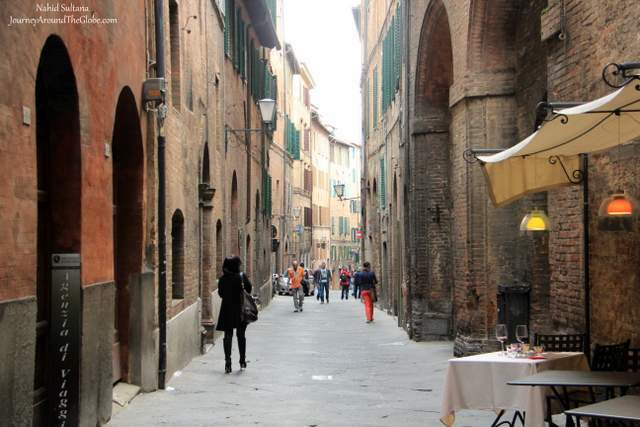 Being a university town, its old town offers a melting pot atmosphere for Nancy’s students, locals, and tourist. TIME of TRAVEL: Nancy was the last stop on our summer road trip of 2014. The main highlight of this trip was visiting Mont-Blanc…the highest peak of the Alps. We also visited Annecy, Chamonix, and Dijon before coming to Nancy. It was a nice weather but Nancy looked a bit slow and less-crowded when we were there. EATING and SHOPPING: We really didn’t eat anything here, except for our girls who had sandwiches from Subway. But streets near Place Stanislas had some cafes and restaurants and shops. Other than that I didn’t really see too many eateries or souvenir shops. 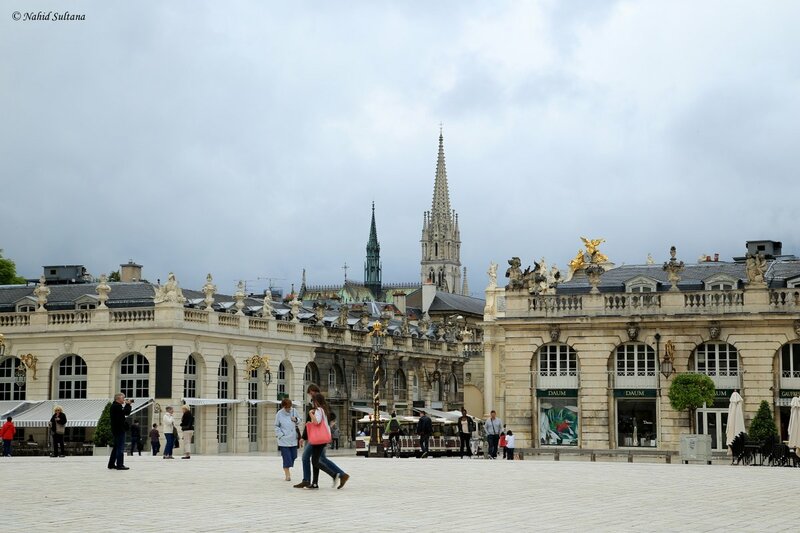 PLACES WE’VE VISITED: We barely stayed only couple hours in Nancy. It was on our way from Dijon to Brussels. So we stopped for a little break and to look around its old part. It makes a great day-trip from places like Dijon. 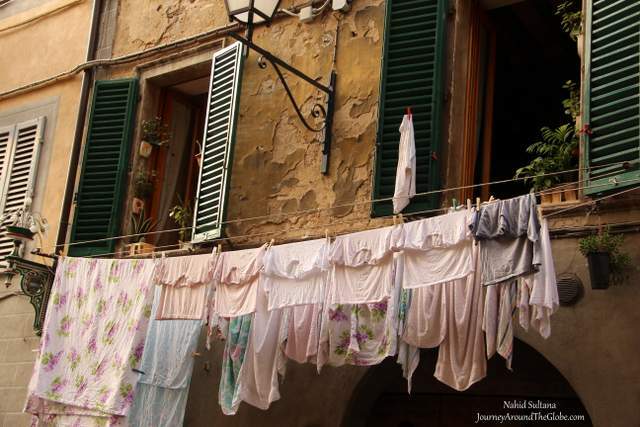 Walking is the most convenient and best way to explore the city. 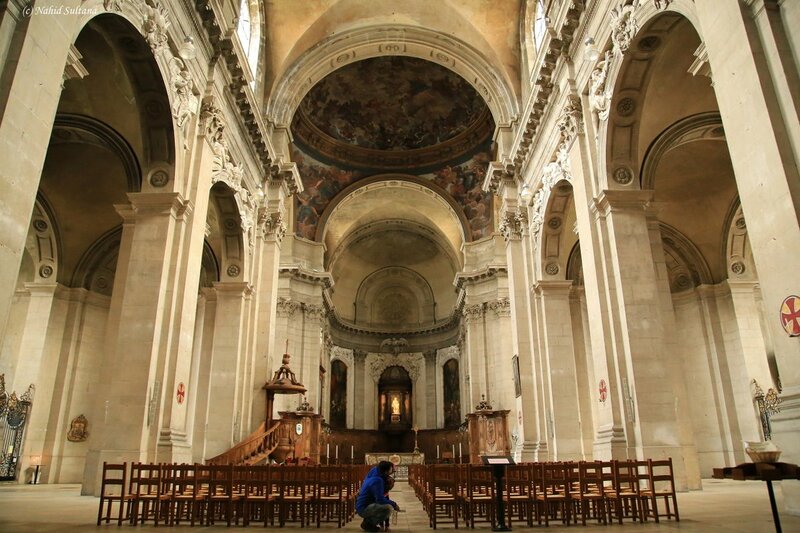 1) CATHEDRAL of NANCY: Also known as Cathedrale-Primatiale de Nancy, was our first stop in Nancy. Nancy is known for having many beautiful and old churches. The church was built between 1703 and 1742. This is a very Gothic looking cathedral with powerful Corinthian pillars, angel sculptures, decorative arches, painted dome, small chapels, and chapel gates. The altar from 1763 is made of different colored marbles. Check out the organ which fills the entire rear of the church. 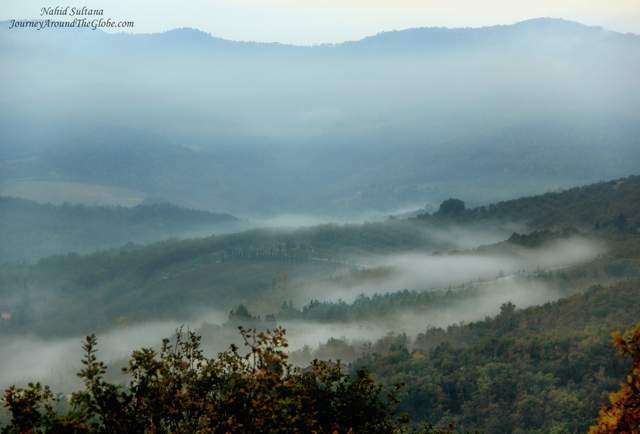 It is considered as one of the most beautiful one in whole France. The façade, as well as the interior are of the Corinthian order. Interior plan has a Latin-cross shape. It’s free to enter the cathedral. 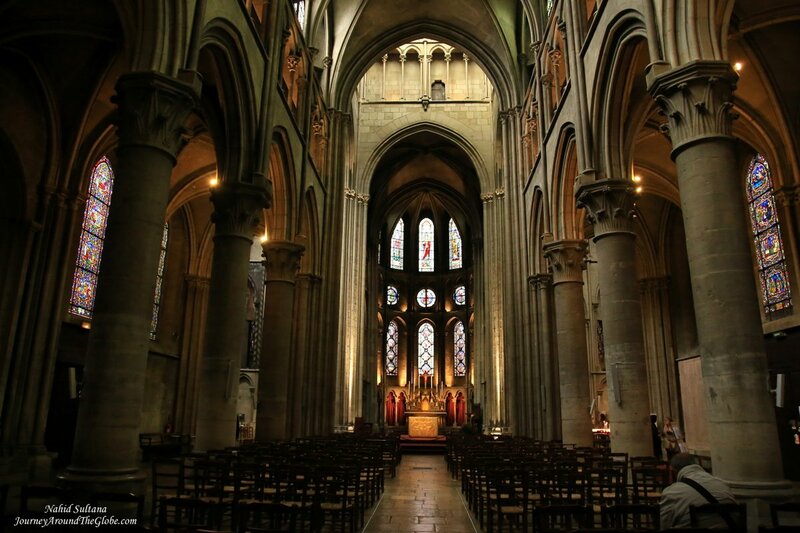 Cathedral of Nancy in France…a Gothic church from 1742. 2) PLACE STANISLAS: Listen as the UNESCO World Heritage site, Place Stanislas is an impressive square from mid-1700s which is a popular public gathering point. Town hall of Nancy stands on one side of Place Stanislas. Statue of King Stanislas dominates the square surrounded by buildings and decorative doors. Right in front of the statue of King Stanislas and opposite of the town hall is Arch Here, which was built in honor of King Louis XV and looks very similar to Arc de Triumph in Paris. The square is guarded by few fancy golden wrought iron gates…reminded me of Tsars’ Village in St. Petersburg, Russia. Two lavishly decorated fountains with statues can be seen on the two sides of this square. 3) LA BASILIQUE ST. EPURE: Our last stop in Nancy before heading back to Belgium was this extravagant basilica, known as La Basilique St. Epure. This is a must-see in Nancy which receives thousands of people from all over the world each year. The basilica is standing over an old parish church from 9th Before this current basilica was built in 1871, there were three more churches that have been erected on this site. 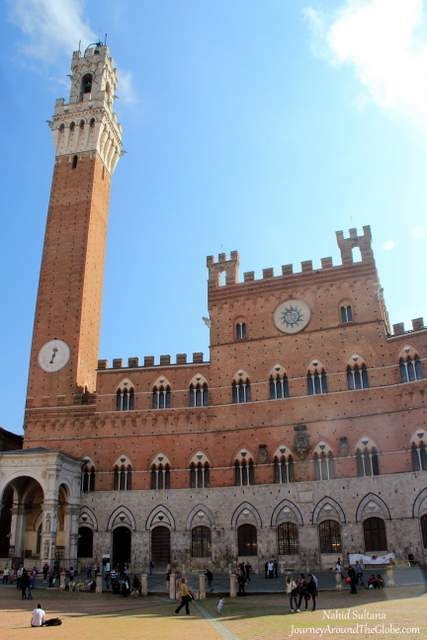 A large number of European artists and architects were involved giving this edifice its present look. Exterior of La Basilique St. Epure in Nancy, France. It was built by many architects and artists from all over Europe in 1871. 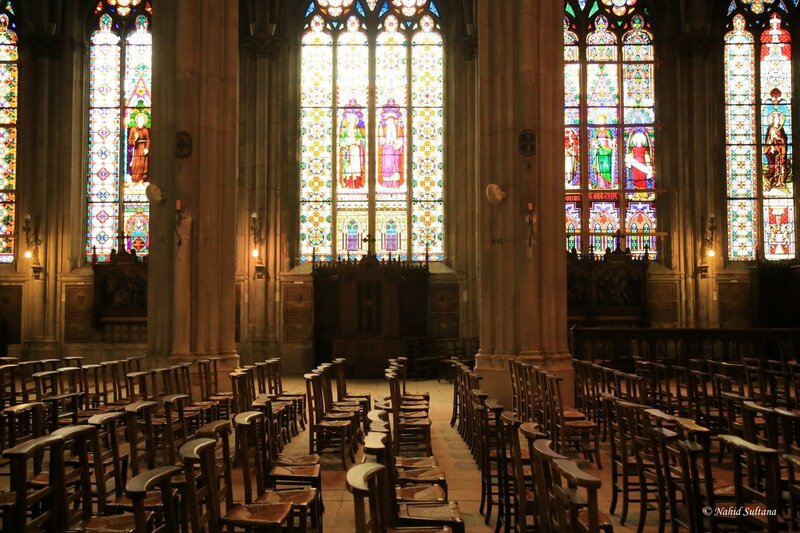 Loved the woodwork, stone carvings, and stained-glass windows here. 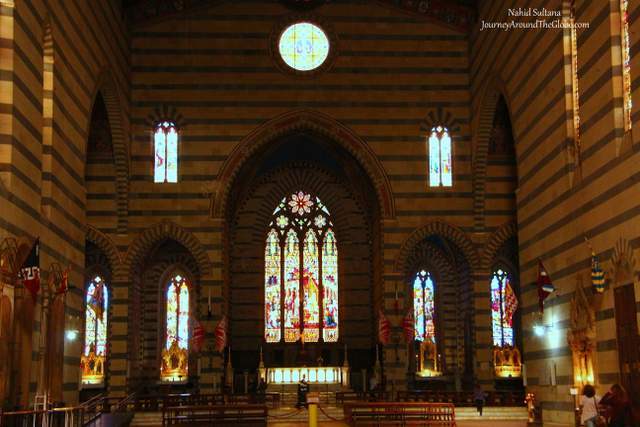 There are 74 large windows and 3 rose windows which all together, represent about 2300 sq. meters of stained glass surface. This church is known to have “more glass than wall”. Most of these windows are from Vienna, Austria. Check out the carved wood decoration on altars, choir-stalls, cross, statues, and pulpit. The church collected items from all over Europe, like the heaviest bell of the main choir is from Hungary, chandeliers from Belgium, a 25-sq. meter pavement from the Pope Pius IX in Rome. Small chapels on the sides and behind the main altar are very decorative with statues, stained-glass windows, and old religious artifacts. Its 84 meters (or 275 ft.) height spire rises high and looms over Nancy’s old town with a glaze. 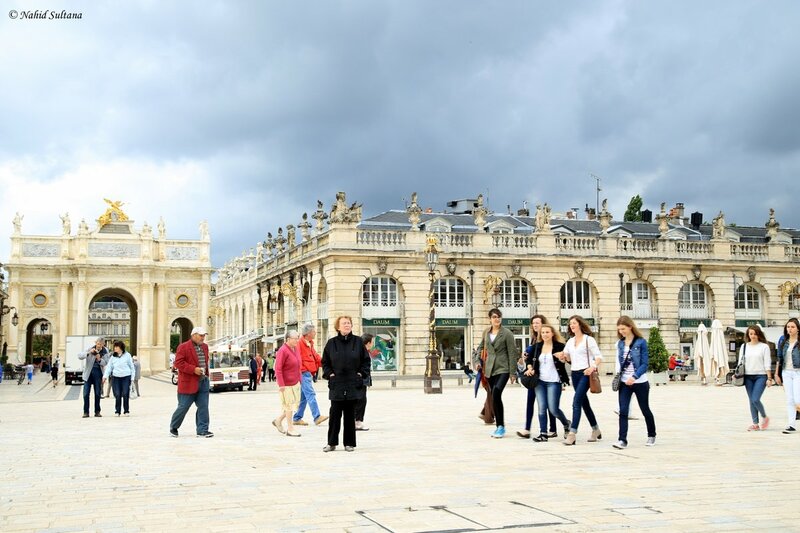 The basilica is located at the very heart of Nancy, only few minutes’ walk from Place Stanislas. There is no fee to get inside. 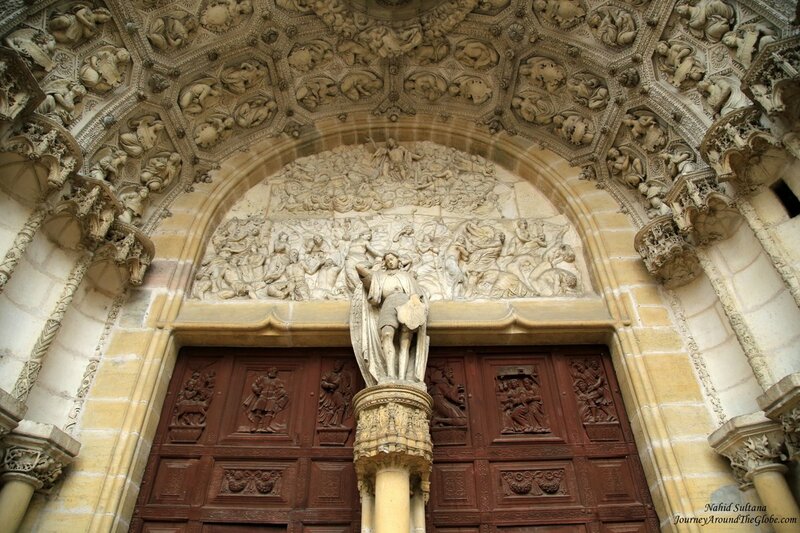 Check out Museum of Lorraine, an artistic building in front of this basilica, which once used to be the Ducal Palace. DIJON, FRANCE: Yep it is that Dijon which you keep in your refrigerator for flavoring your sandwiches or other dips and sauces. And that was the sole reason for me to visit this town. I wanted to know where my Dijon mustard originally came from which I generously use on my turkey sandwich every time. 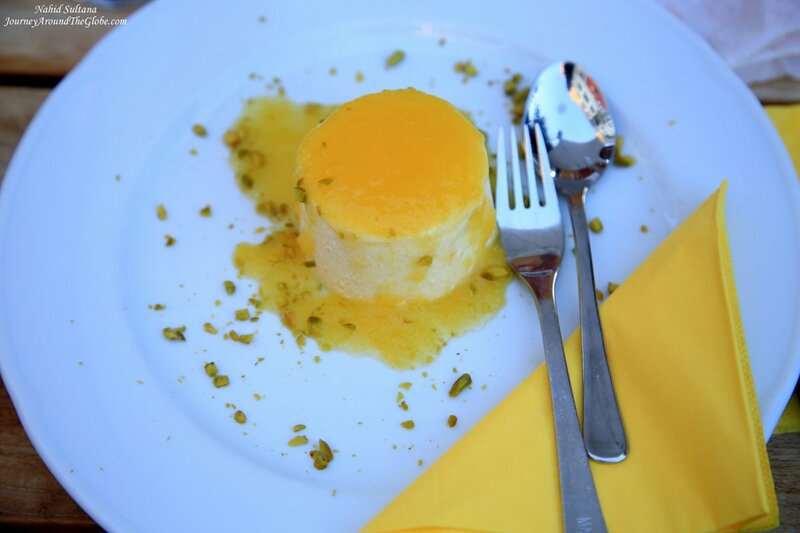 But Dijon is more than just mustard or dipping sauces. Dijon is the capital of Burgundy, a region in eastern France. 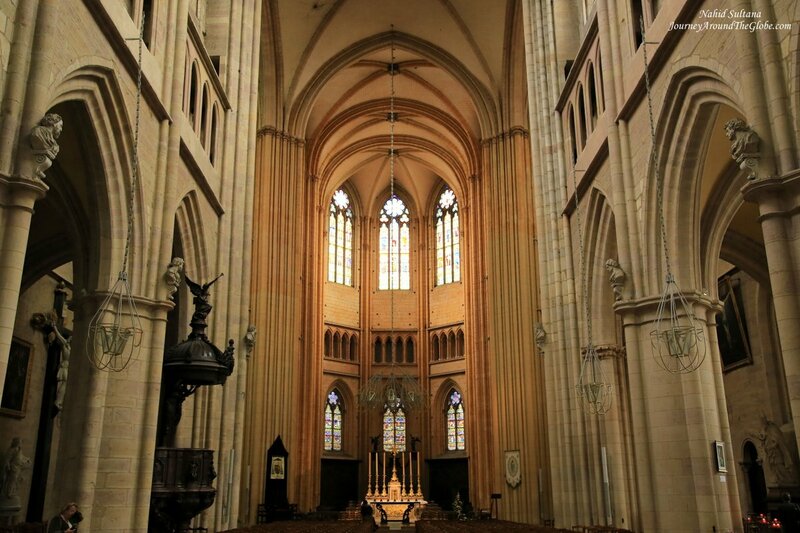 It was a booming major center for Gothic and Renaissance culture and art around 14th and 15th centuries. And since the city wasn’t heavily damaged during the WWII, some of its historic buildings and icons from that era can still be seen around the old town of Dijon. If you have spare time in Dijon, make sure to visit nearby towns and cities, like Annecy, Chamonix, or Nancy. Within couple hours from Dijon, Mont-Blanc stands majestically looking over whole Europe. TIME of TRAVEL: We made a road trip in July of 2014 to the French Alps, visiting Mont Blanc…the highest peak of Alps. After visiting Annecy, Chamonix, and Mont-Blanc, our next stop was Dijon. It’s usually nice in July, but we got some wind and rain the day we were there. Being the last road-trip before leaving Europe, this whole journey was a memorable one for all of us. OUR HOTEL: We stayed in Holiday Inn Dijon, a bit outside the main city center. We had free Wi-Fi and parking but breakfast wasn’t included. Hotel was of course great with cleanliness, staff, and everything else…it’s Holiday Inn after all, good reputation and good service. 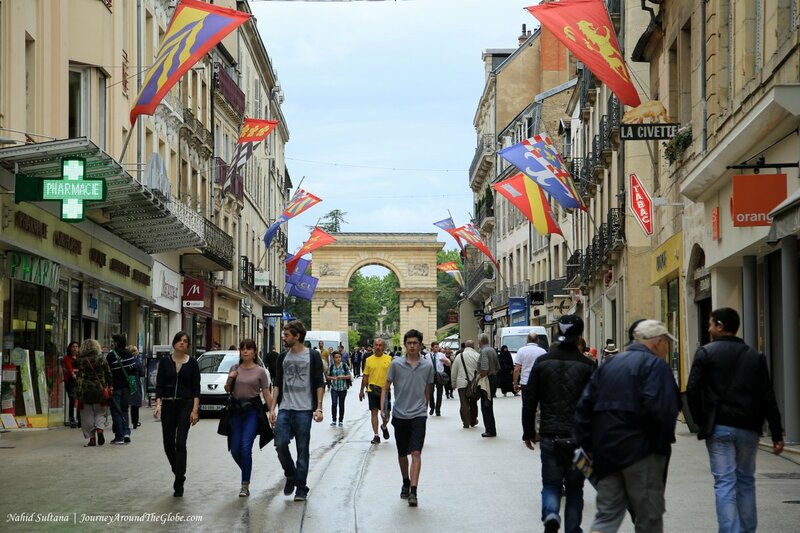 EATING and SHOPPING: Rue de la Liberte is one of the best places for meals or shopping. Other old parts also have hidden cafes and restaurants. We did our mustard shopping from “Maille” on Rue de la Liberte. 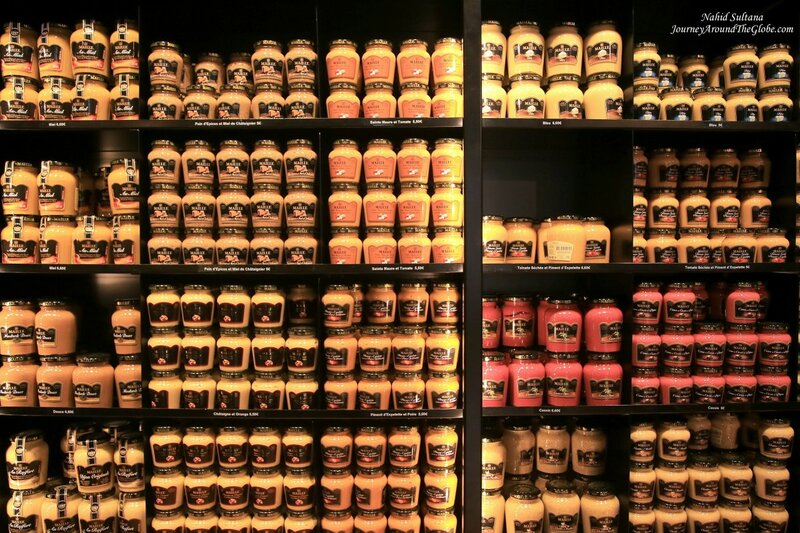 This is a mustard store from 1747 that has more than 30 different types of mustard in their collections. “Edmond Fallot” is another store we went inside where you can find tons of different kinds of mustard and the store dates back to 1840. These stores offer free samples before buying…make sure you know what you are buying. 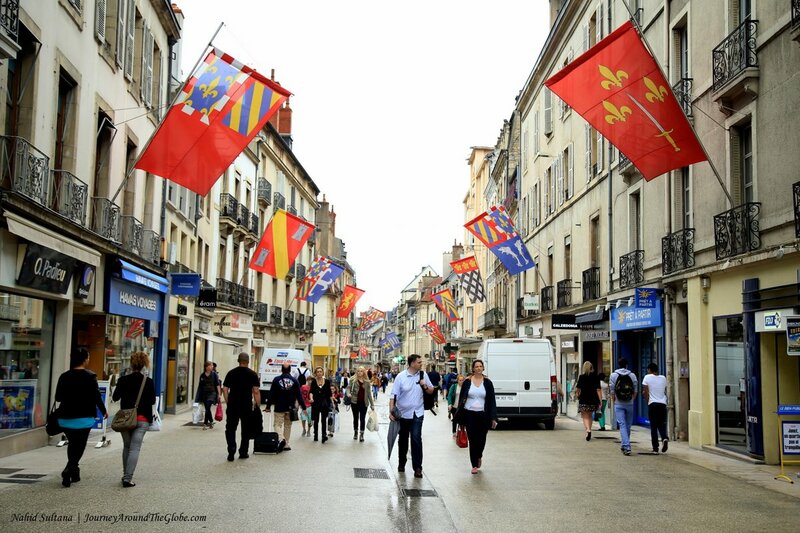 PLACES WE’VE VISITED: Walking is the best way to explore the city center of Dijon. 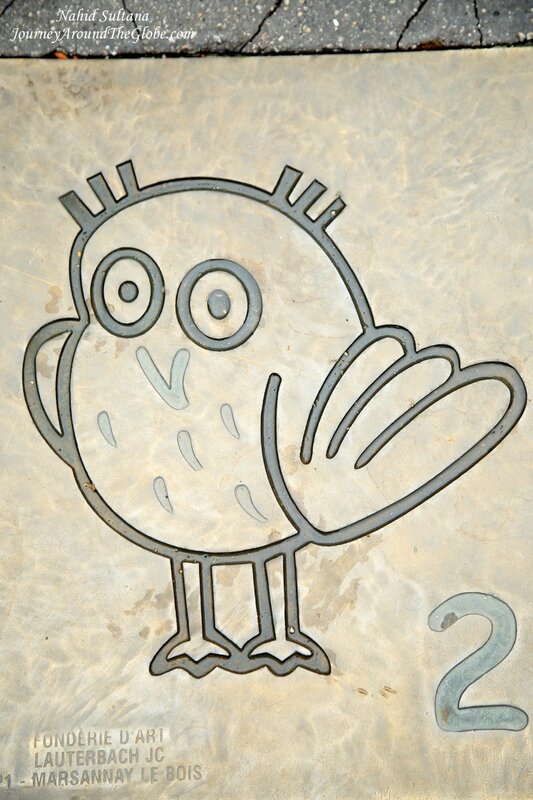 And an easy way to do it in Dijon is following numbered “owl” metal plates on the ground. 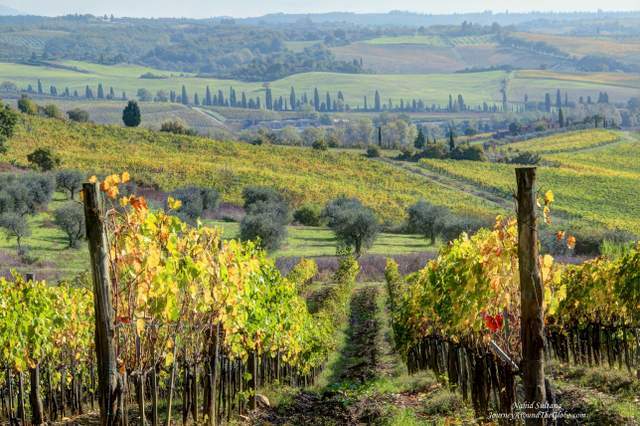 There are total of 22 stops and this self-guided tour takes you to most of the interesting places in walkable distances. Owl is the icon of this city and you will see lots of it at every corner here. 1) LA PORTE GUILLAUME and RUE de la LIBERTE: We parked our car right below this square or pedestrian zone. Rue de la Liberte is a long stretch of pedestrian only path packed with countless shops and eateries. La Porte Guillaume is an old gate, similar to Arc de Triumph in Paris, at one end of Rue de la Liberte. 2) CATHEDRALE SAINTE-BENIGNE: Walking from Rue d la Liberte, you can’t miss the Gothic spires and steeples of this cathedral. Built in the 14th century, this is a national monument of France. Inside is as gorgeous as its exterior. We spent some time going around and enjoying cathedral’s huge organ, big paintings, sculptures, and vibrant stained-glass windows. 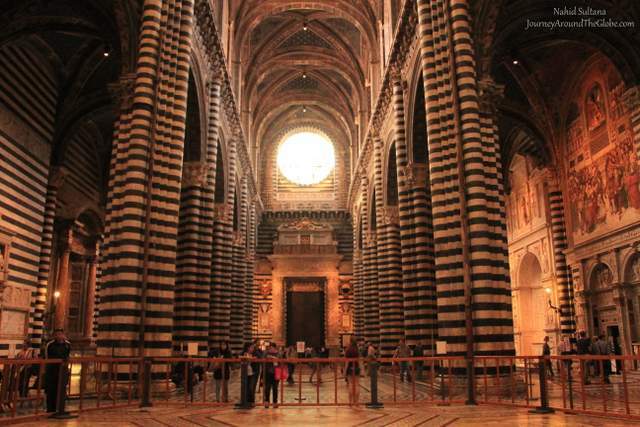 The cathedral is open from 8:30am to 7pm and free for any tourists. 3) EGLISE SAINT-PHILIBERT: Built in the 12th century on the site of an old basilica, this church is a remarkable example of Romanesque edifice. 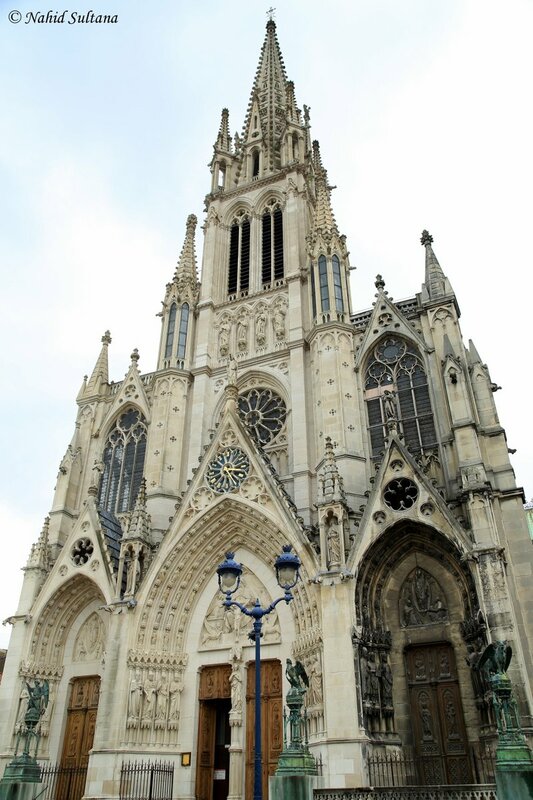 A flamboyant Gothic steeple was added in the 16th It was across the street from Cathedral Saint-Benigne. We walked past it without going inside the church because its current precarious state forbids visits. 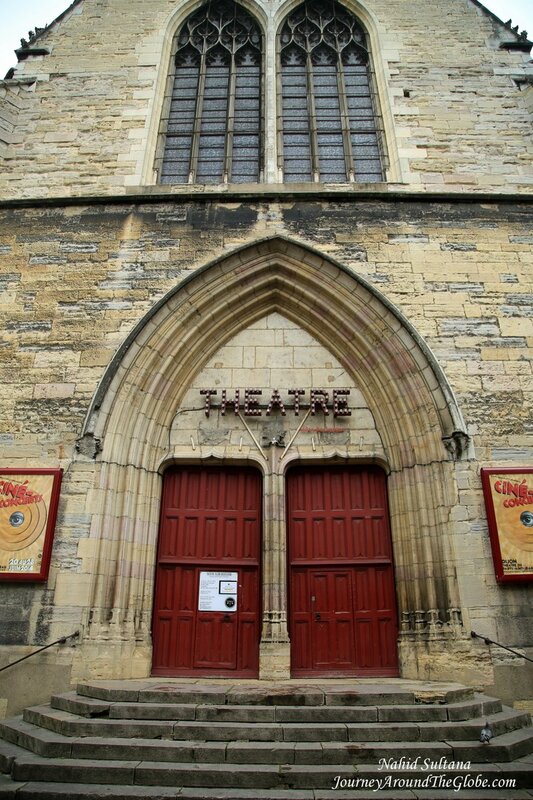 4) THEATRE DIJON-BOURGOGNE: After the above church, we continued following the “Owl” of Dijon and in couple minutes the “Owl” brought us to this old theatre which looked more like a medieval church. This was closed to tourists as well. 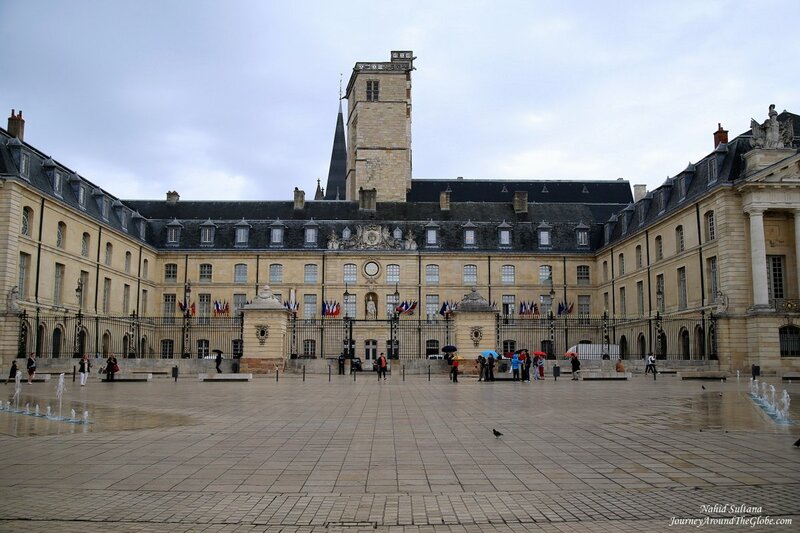 5) DUCAL PALACE: Although we didn’t go inside the Ducal Palace, it is a beautiful building in Place de la Liberation with an open space/square in front of it. It now houses a museum, known as Museum of Beaux Arts, which is considered as one of the best in this region. Other than that it has decent collection of medieval arts, paintings by local and Flemish artists, and some recent art collection which includes Picasso and Monet as well. Place de la Liberation has many small shops, restaurants, and cafes. My girls loved the water fountain in the middle of the square, even though it was wet and cold. 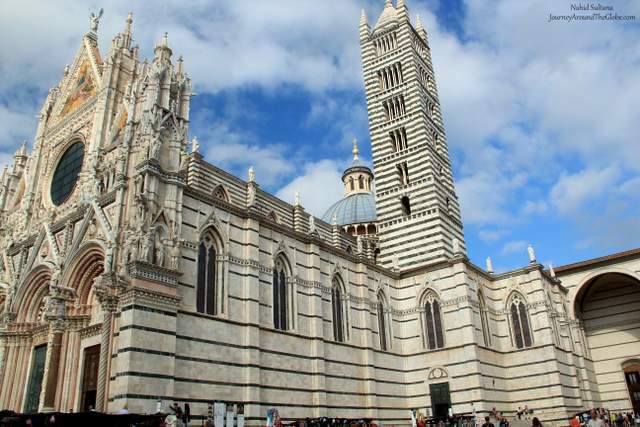 6) NOTRE DAME CHURCH: Just 5 minutes of walk from Ducal Palace is Notre Dame Church. This 13th century church is small but very elegant inside. 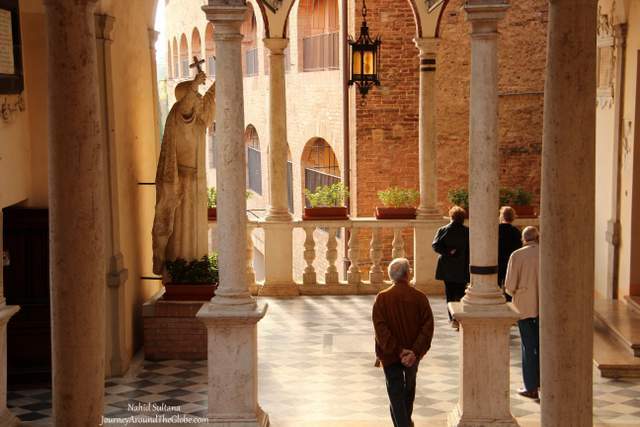 Old walls, stained-glass windows, and bold stone pillars put middle age touches everywhere. 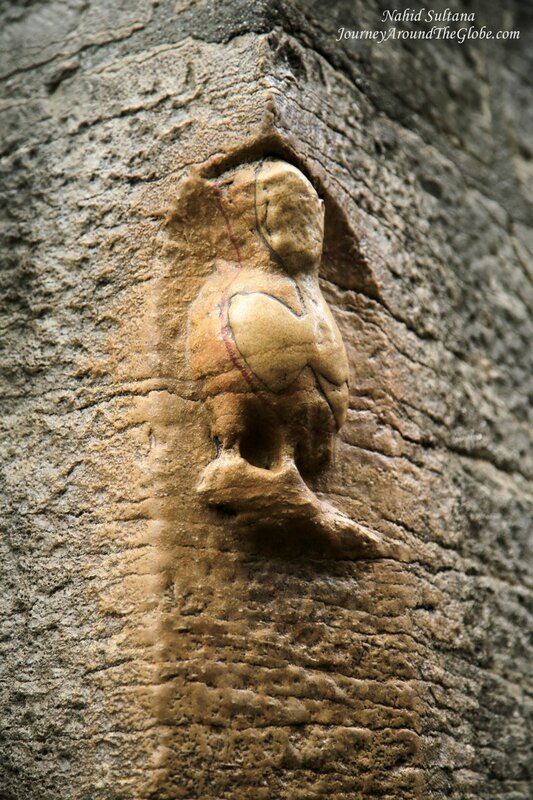 Once you are done with visiting inside the church, go around and look for the “Owl” icon sculpted at one side of the church. This is known to be one of the earliest image of the owl in Dijon, from the 16th century. Tradition is to touch it with your left hand from left to right to bring good luck. 7) MICHEL CHURCH: It started drizzling when we came close to this church. We walked about few minutes from Notre Dame to get here. The present look of this church dates back to the very end of 15th century. The remarkable choir is from 1763. This is a big church, similar to Cathedral Saint-Benigne. It’s free to go in, don’t miss the grand stained-glass over the main altar. 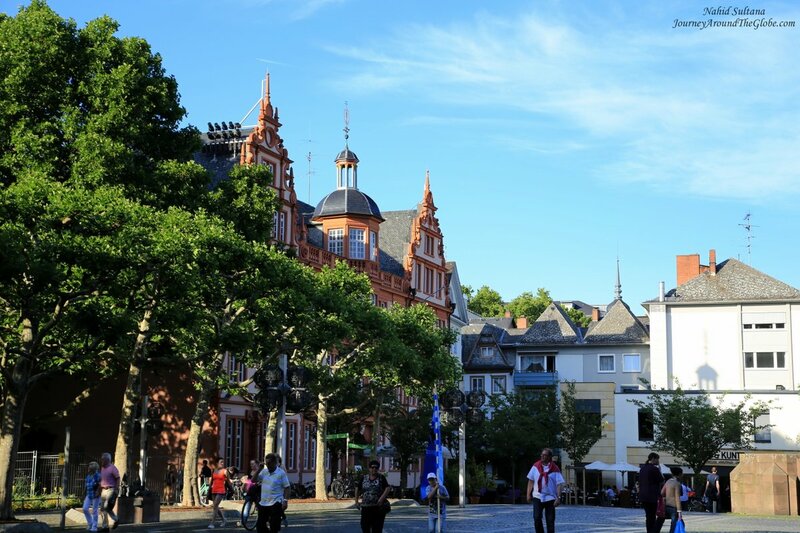 MAINZ, GERMANY: Mainz, a delightful German town situated at the confluence of River Rhine and River Main. This is the home of famous publisher Johannes Gutenberg who introduced printing to Europe and the town where one of the Europe’s oldest and largest music publishing house, Schott Music, is located. Old Town of Mainz is a little cozy place to hang out or get together with someone over a meal. Most of the historic sites are in Old Town and have information boards near them; but they were all written in German, nothing in English. There is a paid parking lot very close to Mainz Dome and the Old Town. TIME of TRAVEL: We were driving from Belgium to Stuttgart, Germany on the 2nd week of June 2014 to one of our friend’s house for one last time before leaving Belgium for good. We chose Mainz as our dinner-venue and to spend couple hours before reaching Stuttgart. It was already around 6pm when we reached Mainz and we stayed mainly in the Old Town. EATING and SHOPPING: Old Town has plenty of options for drinks or meal from McDonald’s to decent local or international kitchens (like “Konoba” a Croatian bar/restaurant). We had dinner at “Maredo” right opposite of Mainz Theatre in Gutenbergerplatz. They had many options for soup, salad bar, steak, and scrumptious choices for desserts. It was already too late to find any store open when we arrived Mainz but Old Town has lots of fashion and other stores all around it. We couldn’t find a single souvenir shop, may be they were on the other streets or further down. 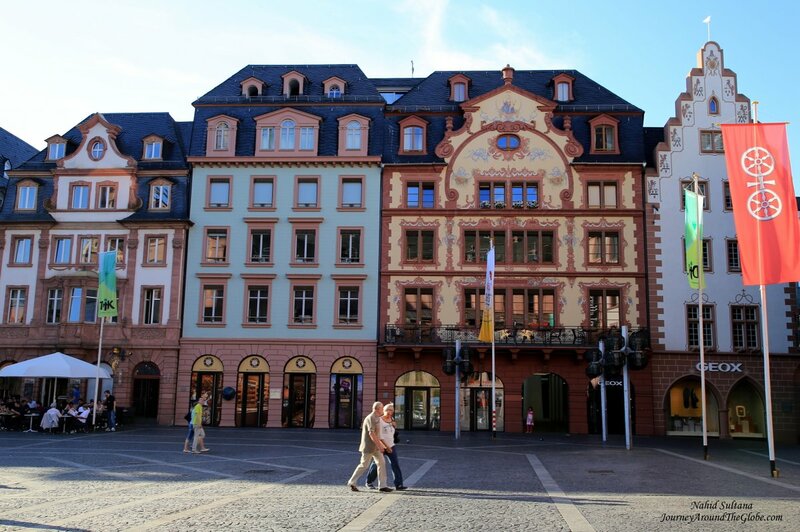 1) ALTSTADT or OLD TOWN: As I mentioned before, we mainly stayed in Altstadt of Mainz. This is the place to be on any lazy afternoon or for strolling after dinner or just for some coffee time. It’s lined with some very artistic and gorgeous buildings opposite of Mainz Dome. We sat down in front of a fountain while our girls were soaking their feet and playing in the water. All the stores were closed when we arrived, but I can imagine this place during day time when everything is open and locals are going on with their lives…a fantastic place to be a part of that atmosphere. 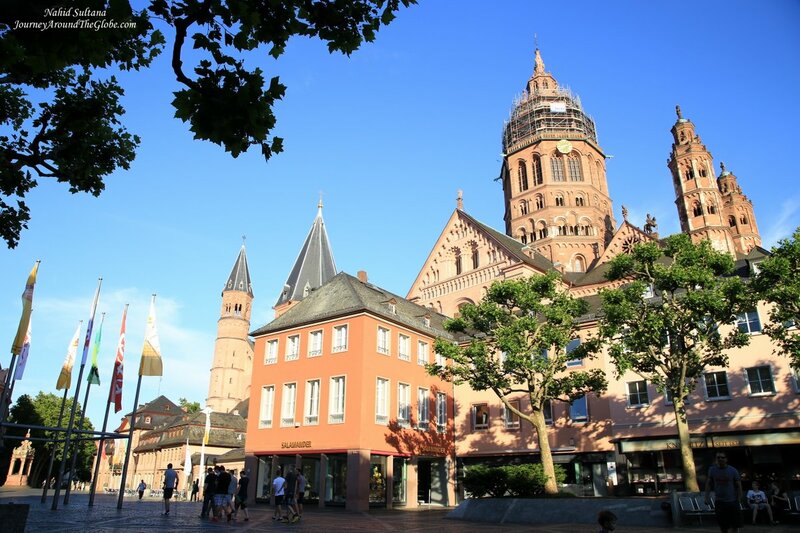 2) MAINZ DOME (CATHEDRAL of ST. MARTIN and ST. STEPHEN): The magnificent steeples of Mainz Dome dominate whole Altstadt and can be seen from any corner. Construction of this Romanesque cathedral started in 975 AD (yep, it’s that old), but its current look is from the 11th to 13th centuries. 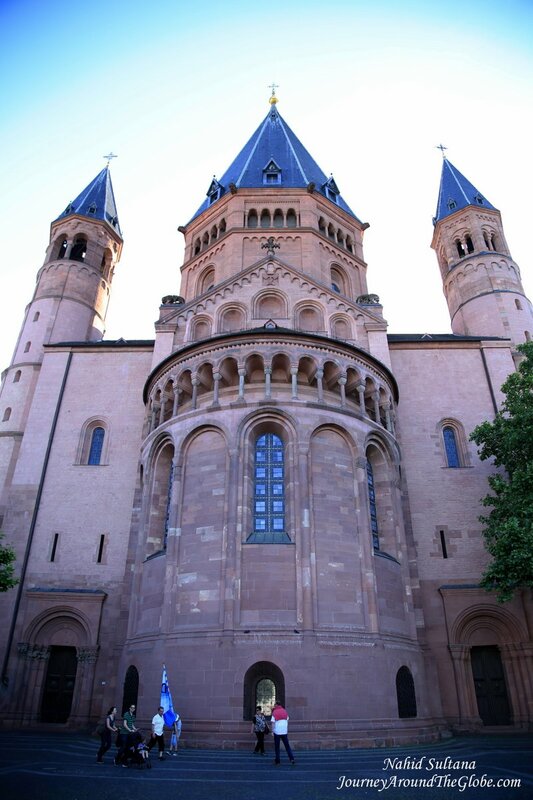 This is one of Germany’s oldest cathedral and a historic landmark of Mainz. It was closed by the time we were there, but still could enjoy its spectacular exterior from every side. Square in front of the cathedral “Markt”, and on the side are really beautiful. There is a miniature version of the dome in Markt. 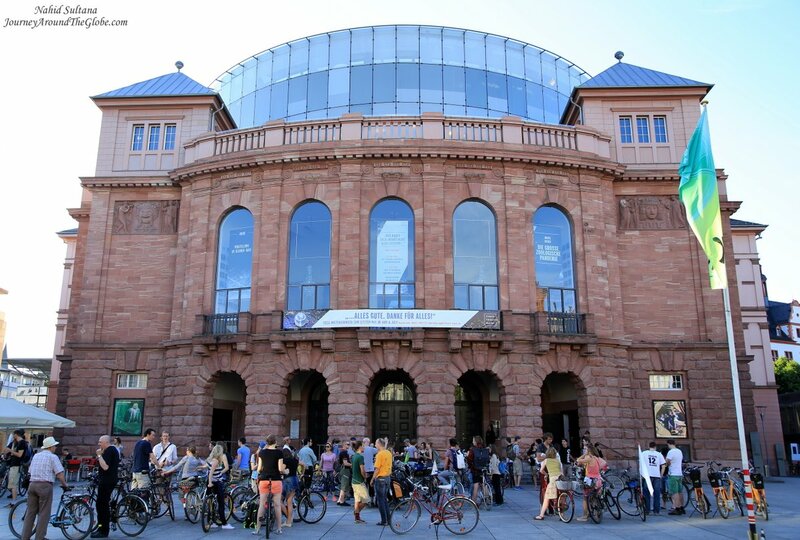 3) GUTENBERGERPLATZ and MAINZ THEATER: Mainz Theater and opposite of it the statue of Johannes Gutenberg are the highlights of this square. Johannes Gutenberg was a well-known inventor who introduced printing in Europe. His invention of movable type printing is regarded as the most important event of modern printing and publishing. There is also “Gutenberg Museum” in Mainz for those who are interested. Gutenbergerplatz is surrounded by many cafes, restaurants, and old buildings. Bunch of young people gathered around in front of the theater and were chatting away and laughing. We didn’t go further down the street and stopped here to come back to our car after finishing the dinner. What a short but lovely trip that was!